If you're new to sat nav this entry-level TomTom is a great place to Start. Just don't expect too much of it, eh? It's Saturday, the city is choked with traffic and you're in a hurry. There are juggernauts to the left of you. Cars full of shoppers to the right. You're queuing in the middle lane and there are four sets of traffic lights, two speed cameras and a coach full of gurning kids in front of you. Oh for the freedom of the open road. You'll get there. And soon. Stuck to your windscreen is the new TomTom Start sat nav - a back-to-basics sat nav that's blessed with all the features you actually need and very few you don't. A grin spreads across your face. You're actually starting to enjoy yourself. As you negotiate the roundabout you think back to how your journey started. Straight out of the box, the TomTom Start put you in a good mood. It's slim, small, with a 4:3 colour screen and a great new windscreen mount that's easy to attach and keeps your sat nav secure. OOPS: The road's empty now. But that's because all the cars roared off leaving us still taking pictures. The man behind wasn't best pleased! On the back of the TomTom Start you find a grey recessed power button and underneath a USB port that not only recharges the built-in battery when you plug the supplied 12v adaptor in the cigarette lighter in your car, but also lets you sync the TomTom Start with the TomTom Home app on your Mac or PC. We said it was simple, and it is. 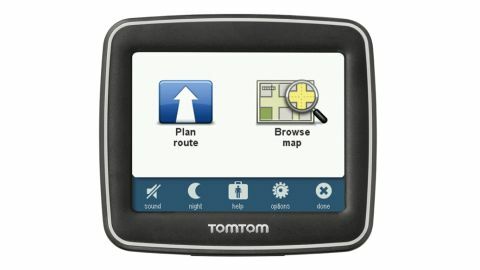 The TomTom Start's home screen presents just two main options - Plan Route and Browse Map. You hit the touchscreen and pick your route: type in the city, then the postcode, a physical address or a Point Of Interest (POI). By the time you've done that, the TomTom Start has already locked on to the network of GPS satellites whooshing around the planet above your head. Which means you're very nearly good to go. Well, in the UK and Ireland at any rate. Because this is an entry-level sat nav, you don't get any of the overseas maps found on other higher end models from TomTom. You do have the option of buying them via TomTom Home though, which is handy if you fancy a driving holiday abroad.